This edible vegetable includes many healing and medicinal properties such as backache and chest pain. 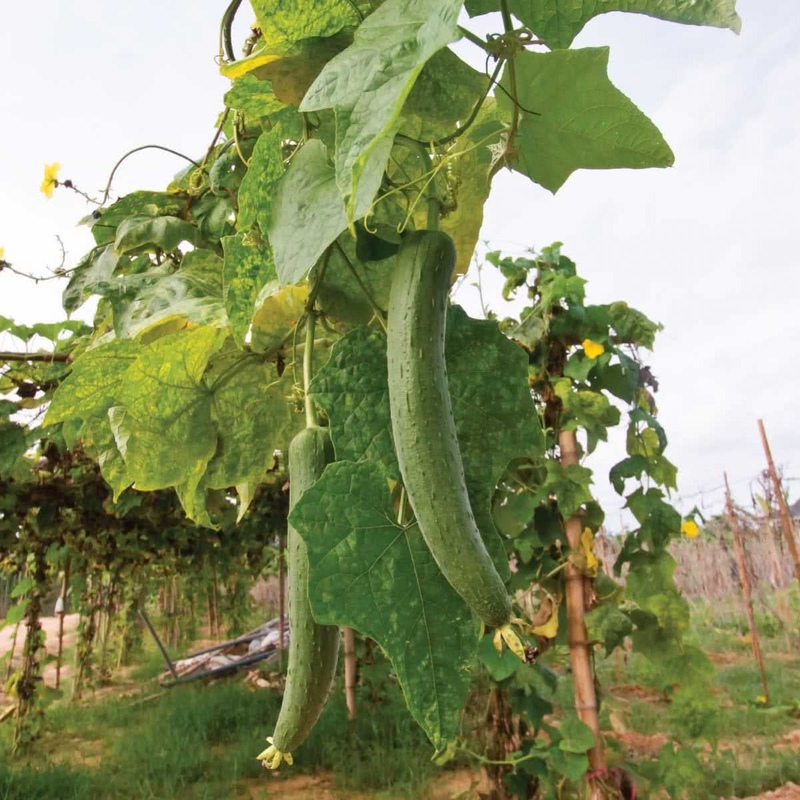 Introduction and Uses: Sponge Gourd also known as Lofa is a wild, fast-growing annual vine. It produces pretty yellow flowers and a traditional vegetable which is edible when immature and is often used as a back scrubber or sponge when mature. This amazing veggie is said to purify the blood by flushing out the pollutants, the insulin in gourds is extremely beneficial for diabetes, it prevents indigestion, helps to prevent cholesterol, cures jaundice and can be coupled with other vegetables to recycle plastic. Sowing Season: Monsoon & Summer. Sowing method: Seeds are sown directly in raised beds or containers. Growing container: Use big circular pots or grow bag with 16” diameter and minimum depth of 8-10 inches. Growing medium: 2 part garden soil & 1 part any Organic Manure or 1 part garden soil, 1 part Coco Peat & 1 part Vermicompost. Take a container of your choice with drainage holes at the bottom. Fill the container with proper potting layers & selected growing medium. Sow 2 seeds at the centre of a pot. On raised beds, sow two seeds per spot in a spacing of 4 x 4 ft.
Push the seeds a little in soil medium with your fingers & completely cover them with surrounding soil. Water the sown seed bed immediately by a light shower with a watering can. Sprouting Stage: Seeds will germinate within first 6-8 days or so & tiny sprouts will be visible. Cotyledons: The first two leaves will emerge in the second week of germination. These are false leaves called as cotyledons. First leaves: First leaves will emerge above cotyledons at the end of the second week. Seedling stage: Second week onwards, seedlings will start growing into a small plant. Thinning: After the second week, keep only single seedling at one spot, Cut off the weak, small & lagging seedlings with a pair of scissors. Sunlight: Sponge Gourd plants require full sunlight. Therefore your raised bed should be made at a bright sunny spot. Keep the Sponge Gourd container under open sunlight. Watering technique: Water your potted Sponge Gourd plant every day in summer. Water the soil near the plant. Use a watering can to make sure that the plants get water in the form of the shower & not by a single flow. You can also make provision for watering by drip irrigation system for your raised beds. Trellis: Sponge Gourd is an aggressive climber & needs plenty of space to grow. So develop a strong trellis support up to height of 5-6 ft, by using locally available material like pipes, bamboo, ropes, wires etc. 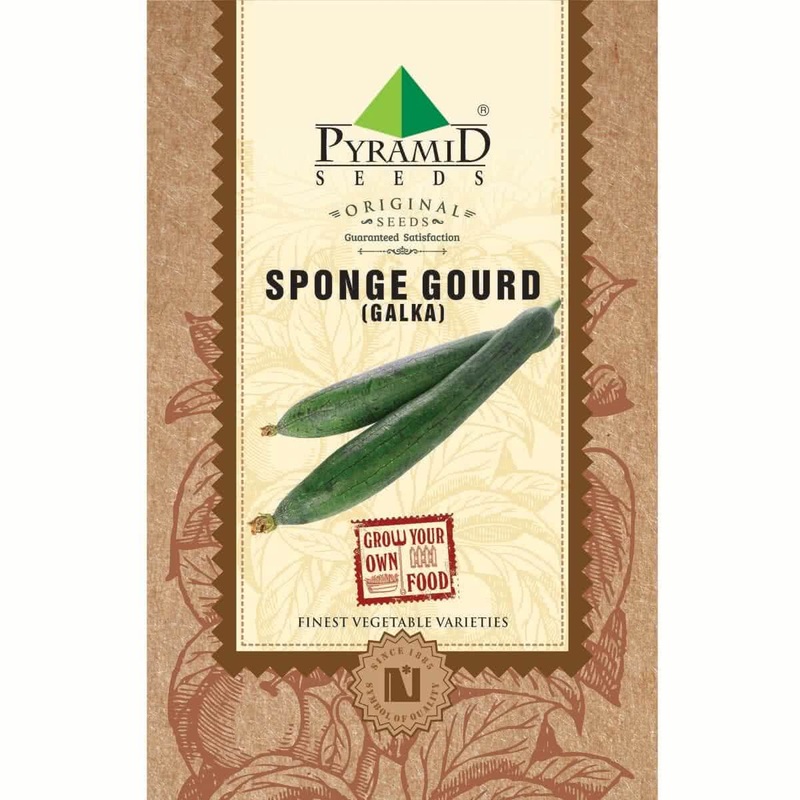 for your Sponge Gourd plant. Read about trellis support ideas. Manuring: As mentioned earlier, add good quality organic manure in the soil with 2:1 ratio before sowing seeds. Organic manure can be well rotten cow dung manure, farmyard manure, Compost or Vermicompost. Top Dressing: When your Sponge Gourd climber is more than 45 days old, Provide one tablespoon of 15:15:15 (NPK) Fertilizer per plant or mix handful of Vermicompost in the soil around each plant. Plant care: Always look for the early signs of any insect/fungal/ any other infections. Spray appropriate medicines as soon as any symptoms of such diseases are spotted. Watch out for Powdery Mildew when plants are young. Read about types of insect pests in your garden. Note: Sponge Gourd have separate Male & female flowers on same plant. Fruits will be formed on female flower after pollination. Hand pollination of flowers: Take ‘pollens’ from male flowers on painting brush or cotton bud & dust them on ‘stigma’ of female flowers. This will increase overall production of Sponge Gourd. This step is not mandatory. Harvesting: (80 to 90 days from sowing) Sponge gourd climber will start flowering at the end of 3rd month. You can start harvesting raw sponge gourd fruits after 3 months of seed sowing. Harvesting season can continue for next 3 months. Approx. 59 to 66 Seeds in 6 gm, 247 to 275 Seeds in 25 gm, 990 to 1100 Seeds in 100 gm, 2475 to 2750 Seeds in 250 gm. 6 to 8 days from sowing. Organic: Neemcake or Vermicompost - 10 g per plant. Chemicals: Suphala or Urea - 5 g per plant. June - July, Feb - Mar. Excellent quality. 100% germination. Yield too is appreciable. Good product with excellent packing. Don’t miss our updates on gardening tips & best practices. Who else understands your love for gardening better than team Ugaoo? Come, let's join hands to create green spaces that speak volumes about your love for gardening. Our extensive product range, decent prices and presence in cities like Pune, Mumbai, Dehli, Bangalore, Calcutta, Chennai, Hyderabad to name a few; will not only help you grow your own food, but will also assist in creating a greener India.